After a timid response to growing opposition against President Donald Trump’s executive order banning travelers from seven majority-Muslim countries from CEO Elon Musk, Tesla and SpaceX have finally joined an amicus brief filed by 96 other companies last night. Reuters reports that Tesla and SpaceX joined companies including Apple, Google, Intel, Microsoft, Lyft, Facebook, and Twitter in the legal filing, which followed San Fancisco’s 9th US Circuit Court of Appeals rejection to reinstate the ban after it was blocked by a federal judge. 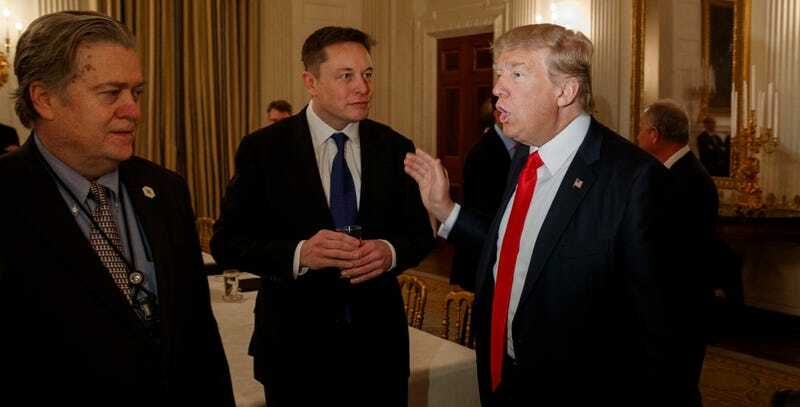 Tesla and SpaceX CEO Elon Musk is now in an even more precarious situation as he still sits on President Trump’s economic advisory council despite growing pressure for him to step down. Uber CEO Travis Kalanick stepped down from the council in opposition to the travel ban last week. Musk’s reaction instead was to use his position “for the greater good,” allegedly making concerns over the ban the priority of last week’s council meeting. Trump, unsurprisingly, must not have taken Musk’s Twitter-requested ideas on the ban to heart, as the Department of Justice has gone ahead and appealed the district court’s decision. For a list of the initial 96 companies to back the amicus brief, Gizmodo has a full list.